The Meizu M6T model was officially unveiled by Meizu Technology. It comes with colorful polycarbonate body, 5.7-inch all-screen display, dual-camera configuration for its rear camera, stable and strong performance guaranteed by its eight-core processor, and its 3300mAh battery ideal for gamers. Backed up with the new Flyme AI acceleration system, it naturally becomes the benchmark that interprets the pure expression of contemporary smartphones. M6T comes with standard 3GB internal memory and three colors: Champagne Gold, Meteorite Black, and Coral Red. Meizu M6T will sway the youthful strokes in the form of its polycarbonate molding with colors of Champagne Gold, Meteorite Black, and Coral Red. The surface is perfected with PPG master paint, which excels at its sturdiness and durability. It’s tough enough to fence off any stains and to keep its brand-new appearance. With its light weight of only 145g, it gains the spirit of keeping up with the times. With its 5.7-inch HD+ all-screen display, M6T is enchanting, delicate on the touch. Its In-Cell complete fit screen technology lights up the screen with all the stories took place in youth time. The fresh Super mBack full-screen gesture interaction is also embedded in the new design. The classic “small circle” brings mBack to the screen by pressure and returns with a light touch, which is considered Meizu’s classic operation. It feels like summer blossoms with the bright screen on, while as quiet as the autumn leaves falling off the tree when it is in standby mode. 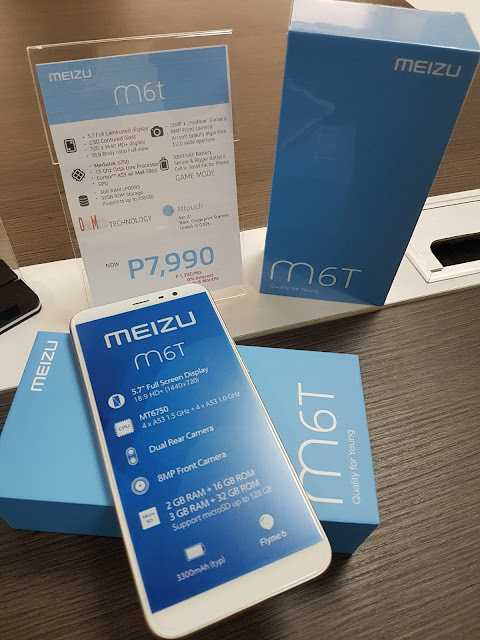 M6T comes with rear facing dual camera backed up by virtual hardware, and it is revolutionary for these affordable smartphones to be no longer restrained on a single camera. In the 13MP + 2MP dual camera combination, M6T main camera adopts the high-performance Sony IMX278 RGBW four-color sensor, which allows the camera to take in more external light and enhances its low light photographing performance. It is now possible to freeze the time and save every wonderful moment on bright color photographs for anybody, especially young adults. In addition to enhancing low-light shooting at the hardware level, the adoption of multi-frame synthesis noise reduction technology also enhances M6T’s low-light performance. The secondary camera responsible for distance measurement makes the background blurry effect even more powerful. In summary, this very affordable smartphone can achieve the same performance as DSLR cameras and shoot exciting photos with large depth of field. it sure will create a shocking wave in the smartphone industry. The front facing, Samsung customized 8MP beautification camera makes M6T easy for self-portraits and video calls. The Rainbow Soft Beautification algorithm is better at presenting your fine-tuned facial skin tone with Flyme’s support, and each selfie is your own avatar. With its internal memory starting at 3GB, Meizu M6T uses the eight-core processor that had been carefully polished over the years. Supplemented by Flyme system’s optimization on memory utilization and application startup, four 1.5 GHz cores focusing on performance and four 1.0GHz cores focusing on endurance are ready to deal with every single one of the mainstream games. Mali-T860 graphics processor and Flyme operating system (game mode) give you all the capability you’ve never seen before for easy control of “The Fifth Personality” and other popular video games from both hardware and software standpoints on the 5.7-inch all-screen display. Meizu M6T is equipped with 3300mAh high-capacity battery, which is a 10% increase over the previous generation, and gives you one more reason to fall in love with it. With the safety guarantee from well-known manufacturer like ATL, and with the thorough power optimization from the Flyme system, M6T has excellent battery performance, resulting in a longer service life, and bid farewell to the embarrassing situation of multiple charging within the day. 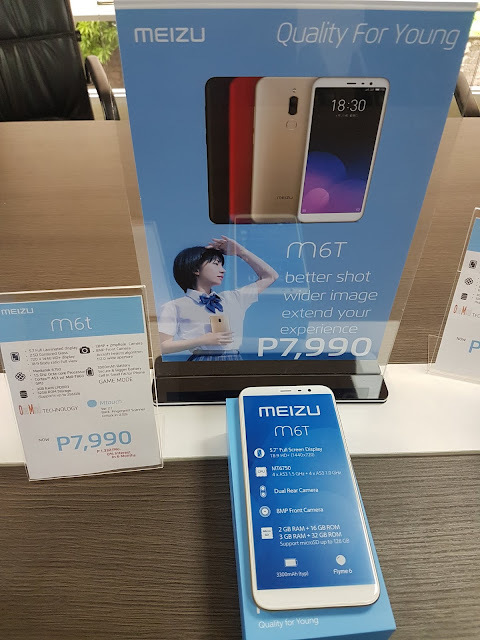 IT WILL COME OUT IN THE PHILIPPINE MARKET SOON.